Ten-year-old Alaa Salem lay in a coma yesterday amid the chaos of an overcrowded Tripoli hospital, her skull smashed open by a sniper’s bullet in her own home. 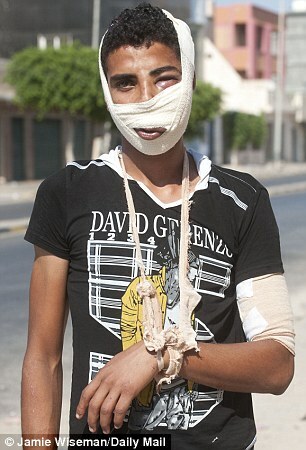 She was ‘picked off’ by one of Gaddafi’s gunmen shortly after clambering from her bed. 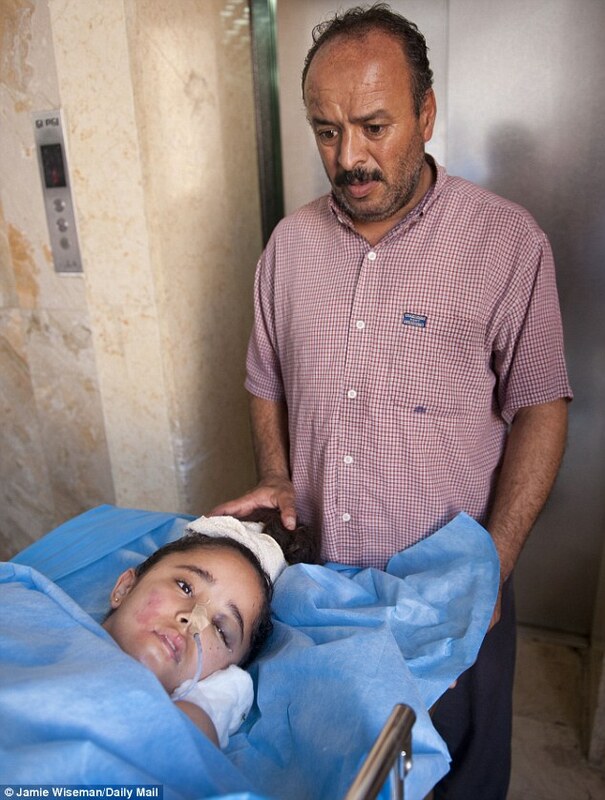 A second bullet tore into the shoulder of her mother Salha as she went to her daughter’s aid. For doctors at the Sharaa Al Zawiya Hospital in the heart of the Libyan capital it is an all-too familiar story. One of their own, a consultant, lies in a coma on the ward, the victim of a sniper. He was targeted as he helped a three-year-old girl shot by a rooftop gunman. Doctors say their friend, like the little girl he went to assist as she arrived at the hospital in an ambulance, will not survive to see the new Libya. The enormity of what doctors face here could be seen on every ward yesterday with dozens of sniper victims only partially masked by the bloodstained curtains around the beds. This brutal urban war is now claiming as many civilian casualities as the rebels and militia who perish while fighting on the front line. Incredibly, Gaddafi’s mercenaries, paid up to 10,000 dinars (£5,000), have been expressly ordered to target the civilian population which has the inevitable effect of paralysing freedom of movement. It means that citizens who briefly erupted into celebration on Sunday now cower in fear of gunmen they cannot see who target them through long-range gun sights. Moments before she was shot, Alaa Salem was lying in bed in her family’s home in Bab al-Azizia, the centre of much of yesterday’s gunfights. Her mother recalled how she had watched as her daughter woke slowly and stood up, still sleepy. Across the street, a sniper was squeezing the trigger of his high-velocity weapon. In the chaotic aftermath, 43-year-old Salha did not immediately realise she had also been hit, in the left shoulder. Yesterday she was in the next bed to her terribly ill daughter. 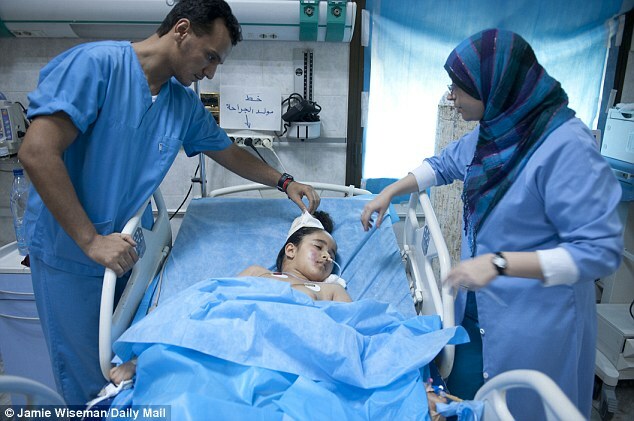 The sniper’s bullet lodged inside Alaa’s brain, leaving her in urgent need of life-saving surgery. Doctors told her parents four long days ago that she would need an operation to remove the bullet, and that without it she could die. But medical shortages in Tripoli meant they could not operate until yesterday as they had no oxygen to keep her alive during the complex surgery. The hospital has been overwhelmed since the fighting began in Tripoli and supplies of oxygen, anaesthetic and other life-saving drugs are now dangerously low. 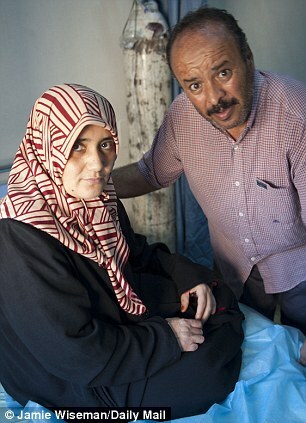 Salha said: ‘The doctors told my husband and me that they could not tell us if she will live or die until they operate. ‘But then they said they had no oxygen left, so they could not treat her. We have waited for three days. Until yesterday there were no doctors here, but now volunteers have arrived to help us, and surgery doctors are here. We need the Red Crescent here, we need medicines and help. We must get help. 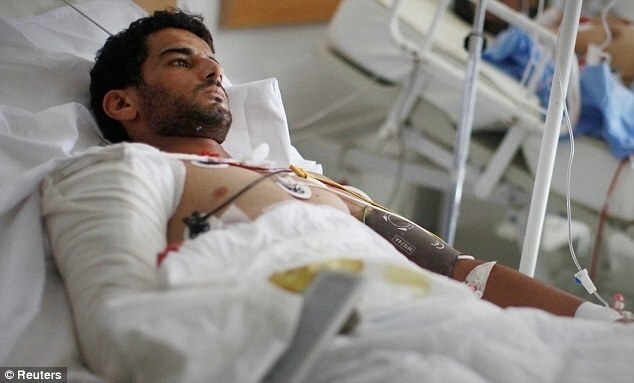 In Alaa’s ward alone, three of the seven beds were filled by victims of the snipers. One, the doctor, was shot inside an ambulance as he brought a patient to the hospital. Medics said he was brain dead, with no chance of survival. An hour earlier, they stopped treating an 18-month-old baby who was also declared brain dead. In a cruel irony, another bed in the ward is taken by a Gaddafi fighter, a mercenary from Chad who doctors said would survive. On another ward, a mother lay crying as doctors examined her stomach, ripped open by a sniper’s round. She sobbed that she was shot as she crossed a park with her children. She lost consciousness and was taken to hospital, but still screams that she does not know if her children are alive or dead. Doctors say there is a desperate shortage of supplies and the snipers are preventing not only doctors and nurses reaching the hospital but also cleaners and chemists. 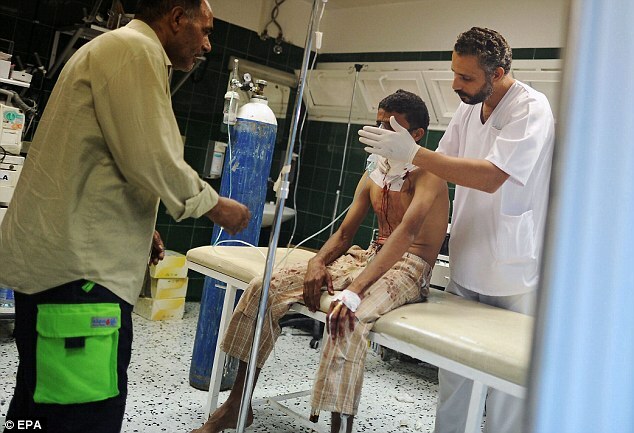 Rebels implore civilians to go to the hospitals to give blood, but they run the risk of being shot by snipers on the way. As we attempted to cross Tripoli, we witnessed rebels flagging down cars to stop them from driving into the snipers’ sights. Streets which were considered safe only hours earlier were closed as the gunmen took up positions on both sides of the highway, picking off cars as they passed by. The crack of gunfire is a constant reminder of their presence, and mixes with the sound of mortars exploding and the call to prayer from surrounding mosques.